Complete fuel system upgrades are available for your specific application. For individual components and alternative parts, just call us. We can recommend a setup for your specific application. RotorSports offers a fuel system upgrade kit for the FD3S. 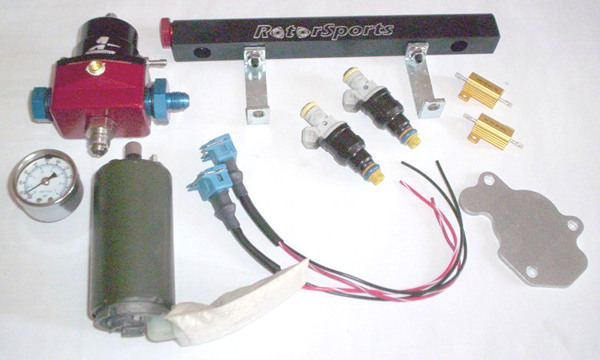 Kit includes a RotorSports Racing secondary fuel rail assembly, two 1600cc injectors with resistors and connectors, upgraded fuel pump, fuel pressure regulator, and optional liquid filled fuel pressure gauge. You'll need an engine management system to control the larger injectors. Does not include high pressure fuel injection hose. We usually retain the stock primary injectors for smooth idle and streetability, with 1600cc secondaries to provide the additional fuel needed. If you're interested in running a different injector setup, just give us a call at 704-933-6222. Due to the different options, impedance, and connectors for FC models, give us a call to configure your kit to your specific needs. Includes RotorSports Racing fuel rail, 2 secondary injectors, fuel pressure regulator, and upgraded fuel pump.